O sing, bright muse! Of Nature's myriad wonders, glorious feats of arms, and the mysteries of all-ruling love! 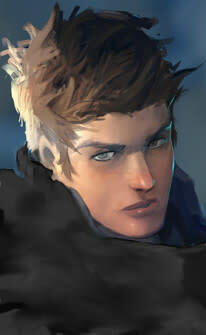 Description: The young man's dark brown hair is short and wavy, and his grey eyes resemble the textures and colors of storm clouds. Though his face is expressive and open, his animal-like gaze often lingers. He is of average height, and a lean build, and his movements are fluid and natural. He has, on his left forearm, a tattoo in the shape of intricately arranged symbols. Personality: Often respectful and curious, Rysen is a seeker of both knowledge and experiences. He is thoughtful and reflective, but wears his emotions on his sleeve, which often shatters plans and expectations in the heat of the moment. He seeks to earn honor and glory in the arts of war and poetry, but knows that he has much to learn, and is more at home in the country inn or wooded glade, than the glittering halls of court. Background: Rysen was born the second son of a distant Crovane lord. His mother is a devout follower of the Faith, and educated her sons on religious matters, court poetry and the practice of virtue in everyday life. He was also trained by Grodin Vales, a veteran soldier of the north who taught him marital skills and survival techniques. After becoming seriously wounded in an altercation with an influential priest rumored to be a relation of his lover, Rysen was sent by his father to Arx. Gianna - My ally in the pursuit of artistic glory. Rukhnis - Not an optimist, but utterly trustworthy. Fianna - My wise and talented cousin. Aethan An artistic lord of Crovane with a keen eye. Bianca Courage, compassion, grace, faith... his words are a thing of beauty, old tales told brought back to life as though by magic. Dante Sharp eyes and wit, there's no stopping a duo such as ours! Gilroy The Northerner Warrior-Poet. Maybe one day he'll end up in the Hall of Heroes and balance out all the Northerner heroes with the big beards. Gretchen He has a great way with words and if Princess Reese doesn't kill him in the ring I hope to see a lot more of him at the spa! Helena A charming and talented poet who I am sure will find confidence in his voice with time. Ian Level head. Reasonable drawing skills. Jeffeth He seems a good man. A good sort indeed, many of the Crovanes seem wonderful and this one is no exception. It was an honor to meet him. Josephine Such eloquence. His words make me smile. IT was a lovely poem and I look forward to hearing more of them in the future. Lorenzo A friendly and interesting man, with ambitions to write a saga. A gifted poet and storyteller, and I look forward to hearing more from him in the future. Lucita A poet who likes music and is charming. He was kind enough to share some of his poetry and listen to a song. I look forward to hearing more from him and sharing more with him. Mikani Tattoos and scars. Sounds like he has many tales of adventures. Mirk A Crovane lord, newly arrived to the city. A swordsman, but a thinker. I doubt a fighting man is all he is, but time will tell. Monique An incredible poet, he truly does have an elegant way of turning a verse. Niklas As much a bard as any who have ever been given the title. His verse is genius. Petal A very talented poet. Seems like an interesting and thoughtful man. Rukhnis Suffers from deplorable lapses of either memory or understanding, but a decent and truly chivalrous person at heart. Sabella A wonderful poet! There is so much creativity and passion in his works. He seems a bit nervous to present them, but I'm sure with enough praise that will fade in no time! Selene An experience to hear his poetic soul in action. Those words traipse across the tongue and the soul, quivering with promise, and speaks to his particular brand of creativity. I look to hear more from him. Sorrel A bard and a swordsman! Someone after my own heart. He's got a lovely singing voice, and he's learning to use his sword so that his swordplay might match his poetry. A poetry of motion in addition to poetry of words! Tescelina He says nice things to the stars. A waste I'm afraid, alas. Venturo Lord Crovane demonstrated tremendous talent during the Kismet Hall, commanding a crowd who wasn't certain what to expect when it came to the carnival in Arx. His choices were perfect and perfectly performed, and I look forward to future viewings of his works. Vitalis Keen mind, though not one to leave to his own devices in the wilds. Strange, I thought Northerners came by woodcraft with mother's milk. Willow So, attractive, Northern, and a poet. What's the catch?